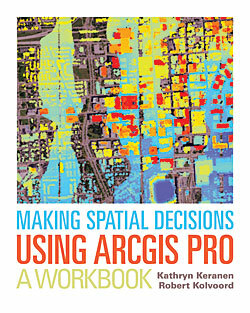 Making Spatial Decisions Using ArcGIS Pro: A Workbook is a college-level text that is targeted at readers who are familiar with ArcGIS Pro and want to improve their skills in applying its powerful analysis capabilities to solve geospatial problems and produce information products that can be the basis of data-driven decisions. It is the fourth in the Making Spatial Decisions series from Esri Press. The book presents activities that use different kinds of data—vector, remote sensing, and lidar—that is analyzed, interpreted, and applied to various scenarios to support policy makers and citizens in making meaningful decisions of the kind that affect the operations of an agency, community, or nation. The scenarios include responding to hazardous spills, analyzing crime patterns, identifying assets that will be vulnerable to flooding; modeling storm surge; creating multispectral imagery for monitoring purposes; performing unsupervised and supervised imagery classification; and generating 3D scenes, suitability studies, and classified maps of canopy vegetation from lidar data. The projects focus on problem solving so they also improve critical-thinking skills. Define the problem or scenario. Identify the deliverables needed to support decisions. Document, set environments, and examine the data. Perform analysis starting with a basemap. Present or share your work. Through this methodology, each module reinforces best practices for documenting analysis and evaluating processes and products. Exercises utilize other components of the ArcGIS platform and take advantage of the close integration of ArcGIS Pro with the platform. The authors, Kathryn Keranen and Robert Kolvoord bring decades of teaching experience to this book. They chose scenarios from a wide range of disciplines. Keranen, a retired teacher, was instrumental in introducing GPS, GIS, and remote sensing into the geosystems curriculum in Fairfax County, Virginia. After retiring, she became a private consultant and an authorized K–12 Esri instructor. She has consulted for various universities and is an adjunct instructor at James Madison University and Towson University. Kolvoord, a professor of integrated science and technology at James Madison University (JMU), has administered a variety of professional and curriculum development grants and workshops to help teachers bring these technologies to their classrooms. His main research interests are in the use of geospatial technologies in K–12 classrooms. Prior to coming to JMU, he worked at the University of Arizona, where he was a founder of the nonprofit Center for Image Processing in Education.